If you’re looking for a pillow that’s soft, light and breathable, down pillows are a great option. They’re also known for conforming to your head and neck, which means a more comfortable night’s sleep. In this guide, we look at the best down pillows for a variety of sleeping positions and give you our top recommendations. Side Sleepers: Because there is very little space to fill between the neck and bed for side sleepers, a firm down pillow is ideal. A firmer pillow keeps the body in alignment and supports the head, neck, and shoulders throughout the night. Back Sleepers: A medium down pillow is the perfect pick for folks who sleep on their backs. It’s important for the upper spine to be supported and cradled during sleep, which a medium pillow provides. Stomach Sleepers: A cushiony soft pillow is best for those who tend to snooze on their stomachs. A soft down pillow will support the neck and keep the head perfectly cradled. Picking up a feather pillow might seem like the ultimate luxury, but in truth, feathers fall flat when it comes to comfort. Aside from a lower price point, there aren’t too many pluses when it comes to feather pillows. However, combination pillows (down, feathers, and down alternatives) can be an excellent investment. Many pillow companies combine down, feathers, and sometimes down alternatives to achieve the perfect mix of support, comfort, and longevity. Feather-only pillows tend to flatten and break down faster, and stay flat unlike down. Quills often poke through lower-quality feather pillows, making for an uncomfortable night’s sleep. If you opt for a feather or combination pillow, make sure the core has multiple chambers to ensure you won’t wake up to pesky, poking feathers. Down pillows can be downright cloud-like, and as mentioned above, they’re a longer-lasting alternative to synthetic pillow options. Here, we demystify the differences between down and down alternatives. 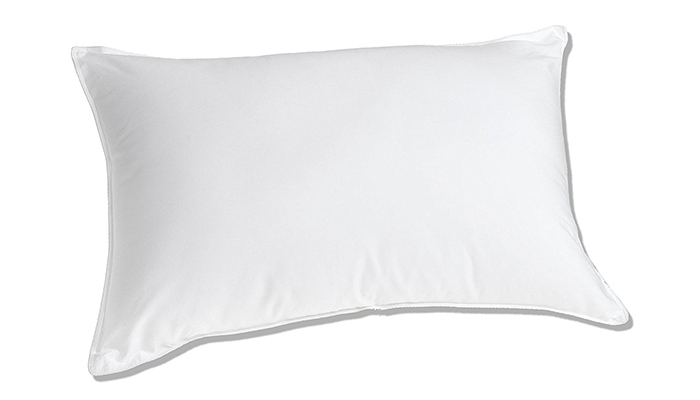 Care: Unlike natural down, down alternative pillows are made with man-made polyester fill. Down alternatives are often easy to clean, as many can be thrown in the washing machine. While most down pillows can also be machine-washed, it’s important to follow care labels. After a wash, the down must be completely dry before resuming use. Allergies: Down alternative pillows are the perfect choice for allergy sufferers. Hypoallergenic options can be found in both down and down alternative choices. Price: Down pillows are often more expensive, but can last up to 20 years if properly cared for. Down has the ability to “bounce back,” while synthetic materials break down more quickly and must be replaced more often. Goose down tends to be fluffier and larger in size. Many folks prefer goose down due to its incredible loftiness and longevity. A foul smell sometimes accompanies duck down, as ducks eat a wide variety of foods. Goose down, on the other hand, is almost always odor-free, as geese nosh only on grass. It’s important to opt for a high-quality pillow with high fill power. To measure fill power, pillow makers measure the space an ounce of down fills at its maximum loft. In other words, the higher the fill power, the larger the clusters of down. The bottom line: Opting for high fill power means choosing a high-quality pillow. These pillows will last longer, maintain their loftiness, and fluff easily. Plus, they insulate like no other. Splurging on a luxurious down pillow? In addition to fill power, don’t scrimp on thread count. Thread count is simply the number of vertical and horizontal threads per square inch of your pillow. Higher thread counts make for the most comfy material, and result in a longer lifespan for your beloved pillow. Top-notch in quality, this premium pillow combines feathers, down, and down alternative materials for a perfect blend of pillowy softness. 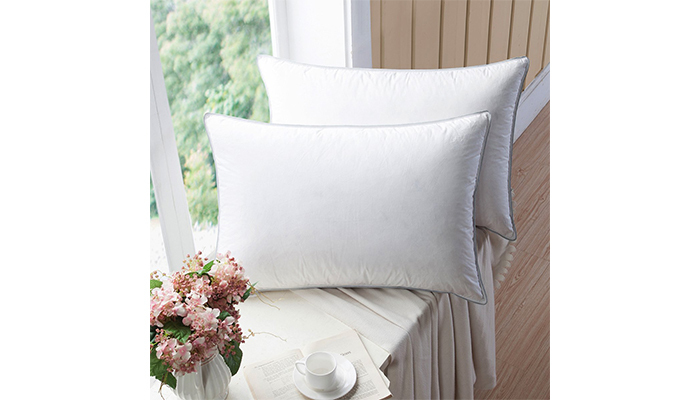 There’s no need to worry about irritating quills, as the pillow has an outer layer of plush gel fibers to keep the inner core contents in place. The shell is made of 100% breathable cotton. Beckham Hotel Collection down feather pillows are made in the USA, come in both queen and king-size options, and are hypoallergenic. Each pillow is resistant to dust mites, mold, mildew, and other allergens, and is carefully inspected and certified by the Responsible Down Standard (RDS). You can rest assured that your new purchase is made with only the best materials. This cushiony option is ideal for all sleep positions, and comes in a convenient two-pack. And if you’re not completely satisfied with the set, the company offers a 30-day satisfaction guarantee. Customers are able to return the pillow within the return window for a full refund, but our guess is you’ll love everything about this pillow pair. Ideal for stomach and back sleepers, LLOVSOUL offers a triple chamber down and feather core to bring you, the customer, the loftiness and coziness of down along with the support of high-quality feathers. Hand-picked down makes up the outer layer, and the inner layers contain 90-percent smaller goose feathers and 10-percent goose down, for the most comfortable night’s sleep ever. Elegant piping is used to construct the pillow, making it attractive, strong, and durable. And the pillow comes along with a 1,000 thread count cover made from premium Egyptian cotton. LLOVSOUL prioritizes comfort and is intent on offering customers the comfiest of pillows. And there’s no doubt that the pillow will spring back to shape time and time again, as the item will arrive at your door in vacuum-sealed packaging. Simply remove the pillow, gently fluff, and within hours, your pillow will be as lofty and dreamy as ever. After just one night with your new LLOVSOUL pillow, you’ll wonder how you ever slept without it. This 100-percent premium goose down pillow option has an impressive fill power of 550. Made in the USA with white goose down feathers, this pillow is the perfect way to pamper yourself after a long, stressful day. The pillow includes a breathable cotton, 300-thread count covering, and the cushiony support is ideal for back, side, and stomach sleepers. Allergy-sufferers will be happy to know that the pillow is hypoallergenic. Best of all, it can be fluffed in the dryer, and is made to last for years to come. Reviewers rave about the high quality and reasonable price point for such a luxurious pillow, noting that the pillow is incredibly soft, yet offers a surprising amount of support for the head and neck. 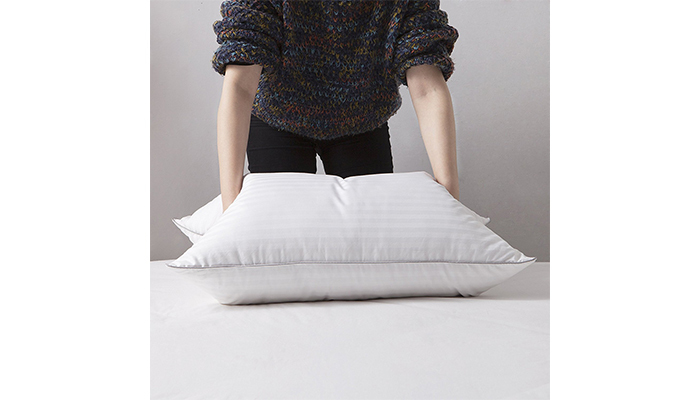 This deluxe white goose down pillow is a dream for back and side sleepers. The medium firm support, 650 fill power, and 330 thread count make it a luxurious option. 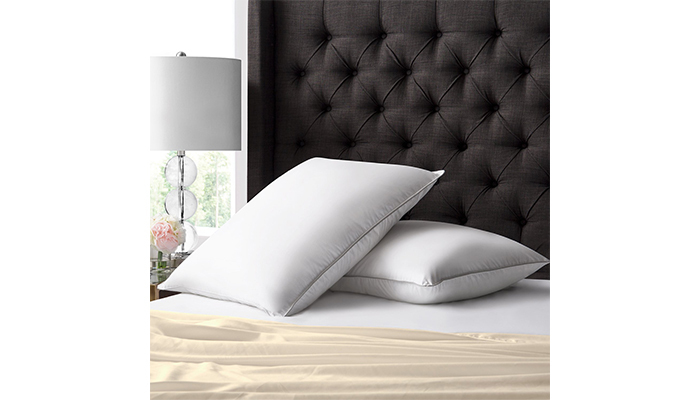 Made with hypoallergenic materials, the 100-percent cotton white sateen shell is the perfect place to rest your head. And because of its top-notch breathability, the pillow is ideal for year-round use, no matter the climate. Luxuredown users love the pillow’s ability to bounce back after repeated use. The pillow is superbly made and holds its shape and loft well. If you’re looking for a pillow that could be mistaken for a cloud, the Luxuredown is for you! Available in a convenient and affordable two-pack, WENERSI offers a premium goose down pillow option that will have you over the moon. The supreme softness and double layered fabric design make this an ideal choice for you and your family. WENERSI thought of everything during the design process. The pillow is perfect for allergy sufferers; it’s completely allergy and chemical-free. Plus, the gentle support makes it ideal no matter which sleep position you prefer. The pillow contains 85-percent goose feathers and 15-percent white goose down, and the covering is 100-percent breathable cotton. And with the affordable price point, you’ll want to buy multiple packs for your entire clan. Q. How do I fluff my down pillow? A. Daily: Manually fluffing your pillow regularly is the best way to maintain its loft and cuddleability. Make fluffing your pillow a part of your daily bed-making ritual by shaking the pillow for a minute or two; this will break up any clumps. As needed: In addition to daily fluffing, tossing your down pillow in the dryer with a fabric softener sheet will revive the pillow. For best results, add a couple of tennis balls; the balls will bounce off of the dryer walls and help the fluffing process. Just like us humans, down pillows need sunlight to thrive. Airing out your pillow in the warmth of the sun will make it bounce back to life. Q. Can I wash my down pillow? If so, how? A. Yes! Well—probably. Check the tag, but most down pillows are machine washable. Your pillow should be cleaned every three to six months to keep it luxuriously lofty and to remove any bacteria, mold, or odors that build up over time. When washing your pillow, be sure to set your washing machine to its gentlest setting. Use only a small amount of mild detergent; liquid is best, as powder can clump and leave residue. If you have two pillows, wash them together to balance your machine’s spin cycle. Wash the pillow(s) in warm water, and repeat the rinse cycle twice for best results. When drying your down pillow in a dryer, set the heat to the low or medium setting. It will take longer to dry, but your pillow will come out just like new. Throw in a pair of tennis balls to help fluff the pillow as it dries, and manually shake the pillow several times throughout the drying process. Your pillows will most-likely take up to an hour to dry. Note: Make sure the down is completely dry before sleeping on your pillow. Keep in mind that some companies recommend dry cleaning pillows only. Always check the care label before tossing into the washer or dryer.